The province of Palawan is an archipelago composed of the main land mass and over 1,700 islands and islets. With about 2,000 kilometers of irregular coastline, it has approximately 10,000 square meters of coral reefs (excluding the Kalayaan group of Islands) resulting in numerous coves and bays serving as rich fishing areas. 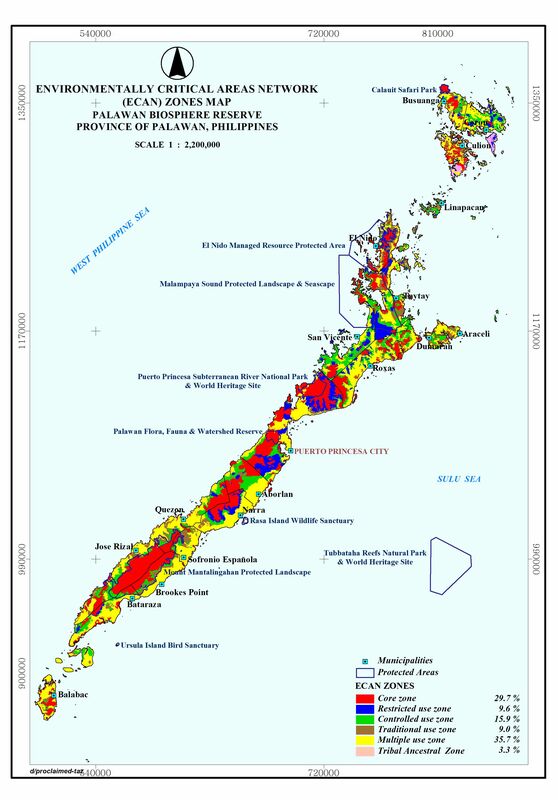 Habitat of rich and diverse wildlife, Palawan cradles more than 38% of the Philippines’ total wildlife species, most of which are endemic flora and fauna. Coastal and marine ecosystems include mangrove swamps, seagrass, coral reefs, and marine meadows. Due to its high biodiversity and remaining intact forest that represents 41% of its total land area, Palawan is better known as the Philippines’ “last ecological frontier“. Moreover, two World Heritage Sites are found in the Palawan BR: the Puerto Princesa Underground River National Park and Tubbataha Reefs Natural Park.